I had a totally sucky week at work – one of those weeks where you can’t seem to do anything right and you feel like everyone hates you. Or almost everyone. Today I fixed something I thought I couldn’t fix and guess what? I feel much better. 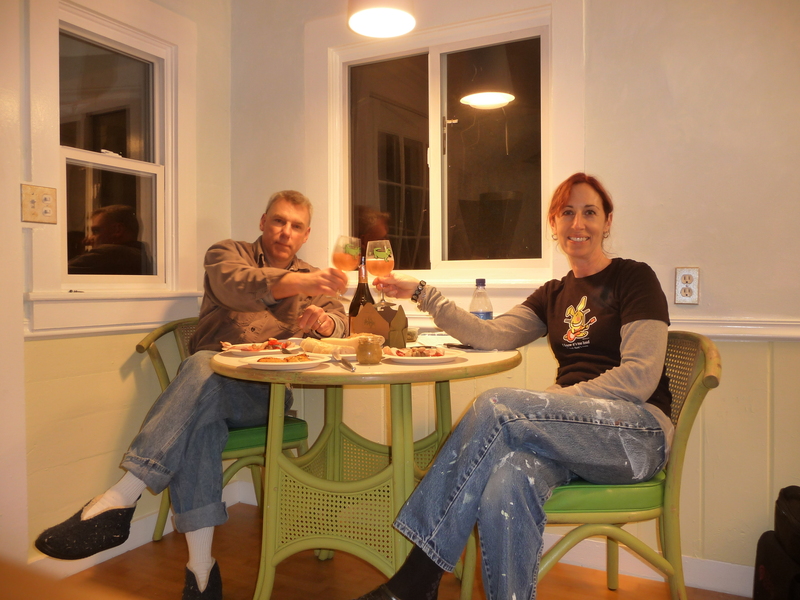 Way back when we were finishing the Library cottage, I found a super cute vintage dining set – two bent wood chairs and a little round table, all shabby lime green. They were perfect – but then the seam on one of the vinyl cushions started to rip. Our first meal in the Library that we actually cooked! Even though the rip had lengthened to about 6 inches (since of course we kept using the chair for a while) I was sure I could fix it myself. After all, how many times had I helped my dad – who was so proud of his mending skills we used to call him The Little Tailor – sew up the seats in his old Volkswagon bug, which we called The Puffing Car because it was so old and tired he had to park it at the top of the driveway facing down the hill and bump start it ever morning? And I have his old darning needles, which I ‘d saved for purely sentimental reasons, but now thought might come in handy. So I bought some super strong upholstery thread. But when I went to do it, it didn’t work. 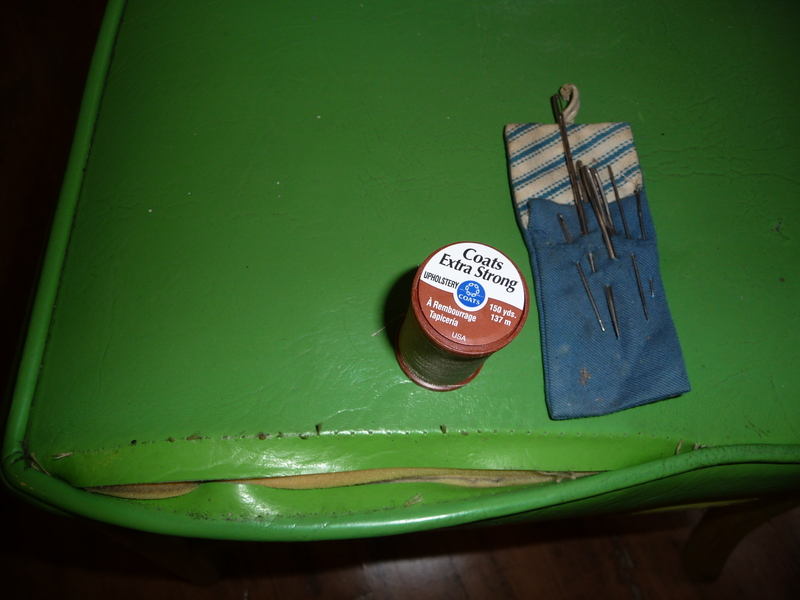 There was no way to mend the seam from OUTSIDE the cushion without having the thread show. And I suffered a failure of nerve – I was worried if I took it all apart I wouldn’t be able to get it back together. So I put the needles away and told my husband I was going to take it in to be repaired. That was a month or so ago and the chair’s been sitting there by the front door ever since. And I was right. Note to self: when you are having a sucky time, there is nothing like fixing something you thought you couldn’t fix to fix it. That’s awesome. Sounds like something I’d do too, can’t count the amount of times I’ve put some small thing off to the side to have someone else repair it because it was intimidating to me to ponder it, and then just…haven’t. This would have intimidated me as well; glad you overcame the intimidation and went for it! Whoa! Look at those big white socks! Your “Note to Self” is so true! Of course, it’s also true that if you are having a sucky time and you attempt to fix something you thought you couldn’t fix, and it turns out you really can’t fix it, that you just feel even suckier. Glad things turned out well for you, though! That is VERY true. I dodged that bullet this time but have definitely had that happen!